Week 3 of the NCAA football season is in the books, and while not much has changed in the Associated Press Top 25 poll, there have still been a few surprises and rising teams to consider. The weekend was a wild one for fans of college football betting as several upsets within the lower to mid rungs of the Top 25 ladder shook things up a bit. Let’s see how our favorite sportsbooks label the new list of contenders and how things have shifted if ever so slightly this week. Just a week after making the cut, Florida and South Carolina were knocked out of the Top 25. The Gamecocks suffered at the hands of one of the best teams in the country, the Georgia Bulldogs, and the Gators dropped a stunner to Kentucky, a team they hadn’t lost to in 31 years. The new kids on the block are Herman Edwards’ Arizona State Sun Devils and the Oklahoma State Cowboys. The Pokes have gotten love from voters since the start of the season and back-to-back blowout victories to start the year have put Mike Gundy’s squad into the 24th spot. 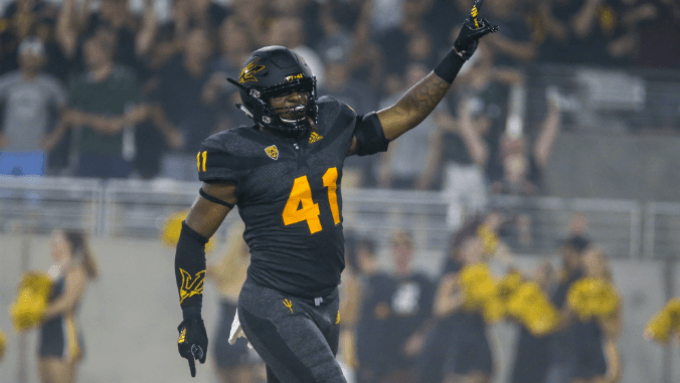 Out in the desert, Arizona State had one of the weekend’s biggest results as they mounted a comeback effort to upset 15th-ranked Michigan State 16-13. The Sun Devils remain the longest shot to win it all of the this week’s ranked teams (Betway has them at +50,000), but it’s all smiles so far in Edwards’ return to coaching. Rising Contenders of the Week? The top ten saw veritably no movement of importance with standout performances all around from the cream of the crop. Two teams on the outside of most people’s championship picture made some major statements, however. Stanford gave USC’s touted freshman quarterback JT Daniels fits and were able to power past the 17th ranked Trojans 17-3. In an offense-friendly conference, Stanford’s defense could be a difference-maker, although the Cardinal have a tough road ahead. Still, they’re worth considering at +5000 with 888sport should you think they'll get through their difficult remaining schedule. Penn State absolutely pummeled instate rival Pittsburgh 51-6 at Heinz Field. If there were any doubts the Nittany Lions were in it for the playoff in a disappointing start against Appalachian State, they were quickly silenced by this result. The defense was humming and three different rushers found the endzone for Penn State, as it reminded everyone its ready to hang with the Big Ten’s best and possibly beyond.